Here are reviews on other sites that you may find useful in your evaluation of Calidar as a potential campaign setting for your game, or as a source of ideas to boost your current campaign. This is a complete campaign in a very readable book. 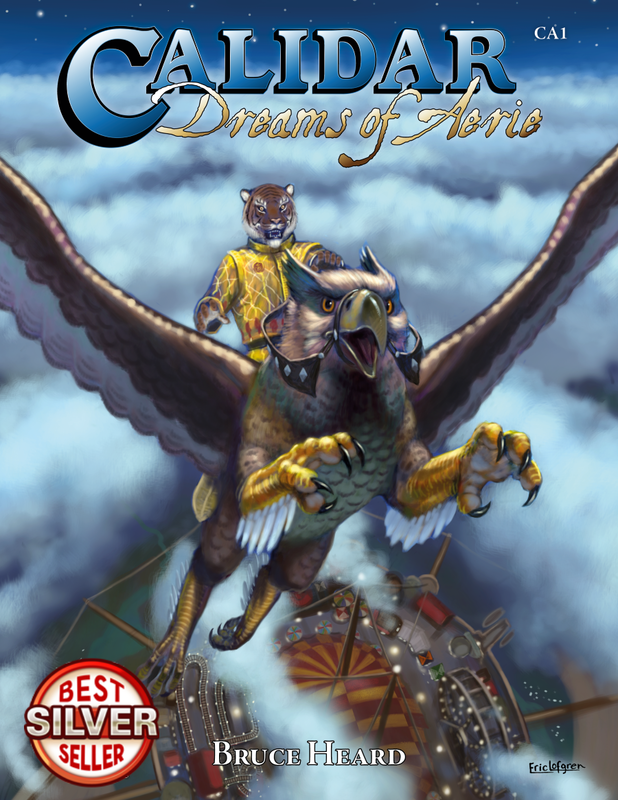 Bruce Heard takes the concept of a flying circus literally, and created a fantastic world within the Calidar campaign. The book is richly detailed, and very easy to navigate through. While I am not knocking the larger Adventure Path compendiums in any way, Dreams of Aerie is able to accomplish many of the same things in a more compact format. I would compare this book to some of the late 1980's TSR Compilations such as Temple of Elemental Evil as far as taking characters from one stage of progression to another without trying to take you all the way from level 1-20 like the current Adventure Path format attempts to do. Dreams of Aerie does have a plot, and several NPCs to drive said plot, but there is plenty of room for the game master to tinker away to customize as they see fit. The generic system Calidar uses should be easy for most DMs to convert to 5E, Pathfinder, or other systems. If you're tired of dungeon crawls, but aren't sure you want a true city campaign, this a great option for you. Nov. 2016, Beyond the Skies review on ENWorld by WebWarlock: "I am reviewing the hard cover version of the book. It is 248 full color pages on decent weight paper and full color covers. I put the production values at the same level of the best of WotC's D&D or Paizo's Pathfinder." Click HERE to read more. Nov. 2016, Beyond the Skies insider review by Thorfinn Tait: "While the god profiles are undoubtedly the core of the book, in fact these chapters also present a wealth of other background material on each nation — so much so that CC1 Beyond the Skies is just as much a core setting book as CAL1 In Stranger Skies (...)" Click HERE to read more. Nov. 2016, Beyond the Skies review on ENWorld: "This is a rare kind of book, the kind I can base a whole world of adventure on. Even though gods are an aspect of D&D type games that I can do without, this has all the flavour that the races and nations gain because of the pantheons of gods that go with them. For any fantasy RPG that makes use of gods and clerics, this is your bible!" Click HERE to read more. EnWorld enables RPG fans to rate and comment about their favorite game products directly on its web site. Calidar has been doing well on this page, competing directly with the new D&D and Pathfinder rulebooks. The image below shows you a view of how well it's been doing as of early December 2014. More than a dozen short reviews are available on that page. But wait! There's more, this time from faraway Norway. Our Favorite Flounder, Mr. Jeff Grubb, also posted this nugget on October 25, 2014: "Calidar, In Stranger Skies, from Bruce Heard gets the lead because it is likely the one you likely haven't heard of, having charted its course into this perfect storm of releases. It is very much the descendant of the D&D Known World/Mystara and Bruce's own stories of the Princess Ark from DRAGON magazine. As a result, it has the wonderful air of adventure of that late 80's/early 90's gaming era. The hardbound leads off with a massive tale of the Star Pheonix and its crew, then drills down from the solar system to the planet of Calidar to the kingdom of Meryath to the city of Glorathon, and concludes with a set of Pathfinder stats and a collection of skyships. An excellent laying of groundwork here, beautifully presented." (Click on the flounder to see his page). Back in August 2014, our own Thorfinn Tait wrote an insider's review. 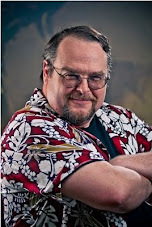 He made the following statement: "With Calidar, Bruce has created a whole new universe with its own themes and tropes. It has some very interesting themes and plot devices built into the story and the setting, such as the Vortex, which allows a limited form of travel between realities; world souls as a source of magic and life; skyships and space travel, including multiple ways to travel the Great Vault; as well as some rather interesting dynamics which shape the relationship between mortals and their gods." Here's a tidbit from the Armchair Gamer, aka. Alexander Osias who says: "Interestingly enough, there is no shortage of settings that I'd like to begin exploring with D&D 5E or perhaps some of the other options out there. There's Calidar: In Stranger Skies, by Bruce Heard. Some promising options there for a colonized world with flying ships and an old school setting feel. Lots of great maps, great art, and great source material for a fantasy romp. (...)" (Click here for the entire article). On December 12, 2014 EnWorld posted a great new review. Neuropglyph said this: "Calidar: In Stranger Skies is a really fascinating and unique world setting offered to the gaming community by a veteran RPG designer. The details about the Soltan Ephemeris and its planets and moons really transports the heroes to a wondrous new world where the sky is no longer the limit, and multiple worlds offer potentially unlimited exploration and questing opportunities. The writing is great, the maps are fantastic, and the science-fiction/heroic fantasy mash-up will doubtless be appealing to many gamers. The fact that the setting was designed as system neutral for most of the content makes this book useful to a wide range of RPGs beyond just PFRPG. And one certainly has to wonder if a version for the new D&D 5e isn’t being prepared? And this world setting is really value priced, a real steal given the vast amount of content, maps, and lore present in the PDF. It’s wonders are bound to delight even the most jaded RPG fan, and I imagine there will be quite a bit of anticipation to see what new supplements will be released for the world of Calidar!" (Click the logo for the entire review). On December 17, 2014, Italian site Isola Illyon added a great article about Calidar, featuring their own rating system. Lorenzo Santini said this (translated from his native language): "Overall an excellent job, well presented, and an encouraging debut for the new publishing venture of Calidar Publishing. If you are a fan of the famous Gazetteers or the saga of Princess Ark, you should not miss this. If you've never heard of them, you should still give Calidar In Stranger Skies a look, because it really is a good product that will give you countless hours of wonderful adventures. But be careful, because once you start reading seriously, you risk being sucked into a dimensional vortex and transported into this exciting new world, which will be hard to leave." (Click the logo for the whole article). On January 7, 2015, a certain 'dungeon master' best known for his popular podcasts at Geekline415 wrote this: "A perspective that says: With a little work on the DMs part, the creative is so deep and "chewy" (not crunchy!) that this could be the beginning of a very fun world for your players to play in. For players I recommend reading the fiction because it will leave you like it did me, wanting to be a part and party to the Calidar world. An epic 5 star rating from me, as I think this is what these games are designed to do, bring out imagination and give us a sandbox to play our adventures in." (Click the logo for the whole article). On January 18, Darius Pearce told on his Five Shires blog the story preceding the creation of Calidar. He also said this: "I was delighted to support the Kickstarter project; on page 25 my step daughter Olivia Evans is immortalised as Olyffia Efanas (although I had no creative control over her behaviour in the story! ), an island to the north west of the great caldera bears the name Pearcelsus Island and in a future publication the Airship the Lady Karevana will carry a crew through the skies or maybe between the planets & moons of the Soltan Ephemeris, we shall just have to wait and see." (Click the logo for the article). On January 19, the French blog Anniceris posted an outstanding summary of "In Stranger Skies," revealing much of this fantasy world's underlying dynamics. The author, "Phersv," wrote this (translated into English here): "Woody Allen was notorious for having said 'I don't want to achieve immortality through my work; I want to achieve immortality through not dying', and the game's solution therefore connects metaphorical immortality through memory and Glory with a (relative) immortality, or at least a lengthened longevity for the Heroes. Their notoriety must be positive and cannot be obtained simply through philanthropic actions; it requires some exploration of Mysteries and the Unknown." (Click the image to read more). On March 31, Judge John-Galt wrote this: "This is exactly the kind of book they won't make anymore. And the kind of book I was hoping for. Calidar is a setting only (system free) emulation/re-imagining of BECMI's Known World/Mystara, and for those that know what I'm talking about, this would be enough information to warrant a purchase. In line with the philosophy of OSR, Bruce Heard decided Mystara could use a modern resurrection, and here is where the vision comes to life." (Click here to read more). Here's an undated entry, written by the Angry GM: "Bruce Heard is OLD SCHOOL. He was working for TSR when it was called TSR. You know, before the bankrupt thing. 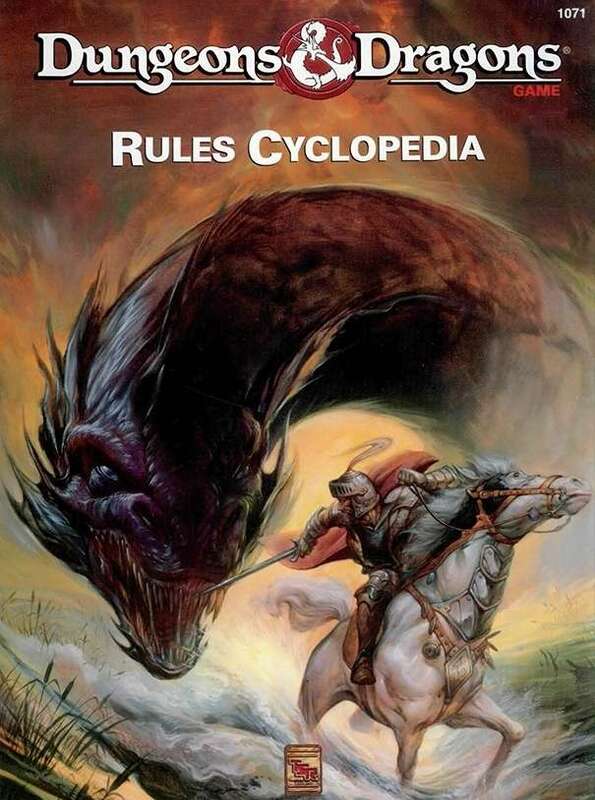 He wrote a bunch of cool modules and was the brand director of D&D when the Rules Cyclopedia came out. Anyway, check out his site because you can check out his pretty awesome campaign setting Calidar: In Stranger Skies. It’s like old school fantasy with airships. But not like stupid steampunk airships. Like, actual ships. Galleons. Real ships. Actually, I don’t know about that. I just discovered the place. I’m still checking it out. But it seems pretty wild. There’s also space travel and sentient, magical planets. So, whatever." Thanks. Hope I don't anger you somehow. In October 2015, Thomas Walton wrote: "Calidar is an entire universe! Endless adventure is entirely possible in this setting. In fact, you'll probably play this game for years! And, of course, this appeals to someone as slow as I am. I like to enjoy a good fantasy the same way other people enjoy a glass of fine wine." Click here for the review. As time goes by, more links to reviews will show up on this page. Check again later for more on this subject. Until then, Happy Gaming!